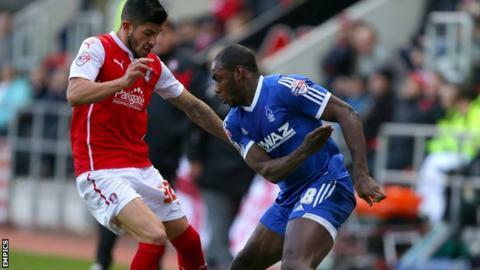 Rotherham's winless run was extended to nine games as they were held to a goalless draw by Nottingham Forest. The Millers went closest before the break, with Emmanuel Ledesma cannoning an effort off the crossbar before Tom Lawrence shot wastefully wide. Henri Lansbury headed over for Forest early in the second half after good work from Michail Antonio. Keeper Karl Darlow ensured Forest shared the spoils, saving a Reece James shot with his legs. Despite drawing for the sixth time in nine matches, Rotherham moved three points above the relegation places following Brighton's 1-0 loss to Millwall on Friday. Nottingham Forest are unbeaten in the last 17 meetings in all competitions against Rotherham United, winning eight. Rotherham's last win was 3-2 at home in the old Division Two in September 1956. The goalless draw is their first meeting since a 1-1 draw at the City Ground in League One in April 2007. Forest, meanwhile, go ninth in the Championship table, but are now five points off play-off places following Watford's 2-1 win over Wigan Atheltic. The Millers were almost gifted an early chance with Forest keeper Darlow mis-kicking a backpass from Kelvin Wilson before recovering to clear as Alex Revell closed in. Antonio created two inviting openings for Forest before the break, crossing for Dexter Blackstock to head wide at the back post before whipping the ball in for Britt Assombalonga to prod off target. Darlow saved from Ben Pringle, but Ledesma almost put the Millers ahead with a fierce 25-yard effort which struck the woodwork. A minute later Lawrence steered an effort wide for Steve Evans' side after James found the on-loan Leicester City forward unmarked in the box. Lansbury nodded over early in the second half following more good work from Antonio down the left, and although Blackstock found the back of the net with a header before the hour, his effort was ruled out for a push. Pringle squandered a glorious chance to put Rotherham ahead soon after, blasting over from six yards after Lawrence found the midfielder with a neat cut-back pass. And Darlow ensured Stuart Pearce's Forest left the New York Stadium with a point by foiling on-loan Manchester United defender James. Rotherham manager Steve Evans: "I think Stuart Pearce will drive home tonight and think he's sat next to Robin Hood because they have stolen a point. "I thought our performance was absolutely superb. "If you look at the names on a piece of paper that Stuart can call upon you would be frightened to play them." Nottingham Forest assistant manager Steve Wigley: "We don't normally have a problem scoring. We've normally got goals in us. "We've got two players in double figures but we will have to take a point and have to do better next week against Leeds. "We worked very hard. The lads gave everything they've got but we are fully aware that we have got to play better in and around the final third than we did." Match ends, Rotherham United 0, Nottingham Forest 0. Second Half ends, Rotherham United 0, Nottingham Forest 0. Attempt missed. Paul Taylor (Rotherham United) right footed shot from outside the box is close, but misses to the left. Assisted by Tom Lawrence following a set piece situation. Attempt missed. Daniel Fox (Nottingham Forest) left footed shot from outside the box is high and wide to the left. Assisted by Henri Lansbury following a set piece situation. Hand ball by Alex Revell (Rotherham United). Tom Lawrence (Rotherham United) is shown the yellow card for a bad foul. Attempt missed. Eric Lichaj (Nottingham Forest) right footed shot from outside the box is too high. Substitution, Nottingham Forest. Tom Ince replaces Dexter Blackstock. Corner, Nottingham Forest. Conceded by Craig Morgan. Corner, Rotherham United. Conceded by Michael Mancienne. Attempt blocked. Emmanuel Ledesma (Rotherham United) left footed shot from outside the box is blocked. Attempt saved. Reece James (Rotherham United) left footed shot from long range on the left is saved in the centre of the goal. Assisted by Alex Revell with a cross. Offside, Nottingham Forest. Michael Mancienne tries a through ball, but Britt Assombalonga is caught offside. Corner, Nottingham Forest. Conceded by Kári Arnason. Attempt missed. Emmanuel Ledesma (Rotherham United) left footed shot from outside the box is too high. Assisted by Alex Revell. Attempt missed. Tom Lawrence (Rotherham United) right footed shot from outside the box is high and wide to the right. Assisted by Richard Smallwood. Attempt missed. Ben Pringle (Rotherham United) right footed shot from the centre of the box is too high.